Cobia, also known as Lemon Fish or Ling, are all fish in the Gulf of Mexico found swimming the surface, and also in deep waters. Swimming singly, or sometimes in small groups of 2 or 3, Cobia appear distinctly shark like when viewed from above. At MGFC, we fish for Cobia in Spring, Summer and Fall. Wanna catch cobia? They’re naturally curious fish, and it’s common for us to see them looking right back at us from the underside of the boat. In fact, many charter captains and experienced anglers have witnessed cobia chasing other reef fish, such as snapper from the depths all the way to the surface. Cobia have a tendency to make a sharp distinct run out, then circle back towards and around the boat. Cobia is one of the most popular game species anglers can target during the Spring and Summer months. The fish migrate across the Gulf, and move into Mississippi and Louisiana waters to spawn. They do look like sharks, or perhaps like ocean-going catfish, but they’re distinguished by dark brown to dark gray color, turning to white underneath, and they lack sharp teeth. Besides, once you’ve got a mature Cobia on the line, you’ll know it from the reel scorching run it puts on. Cobia are found near rigs, reefs and other floating structures such as navigation buoys and channel markers. They swim both at the surface, and down deep, and also are known to accompany mantas and other large rays. Book a trip with MGFC now! 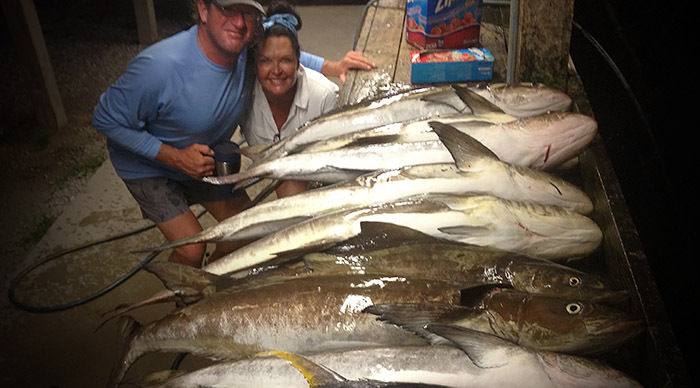 Whether you’ve experienced a charter trip going for Cobia , or if this is your first time, give us a call. Let’s catch some Cobia with MGFC!